Entrekra's Gerard McCaughey puts a UK perspective on holistic built vs. U.S. penchant for stick built. Modular, panelized, and manufactured home construction have been marketed as time-saving alternatives to stick building, but the real disrupter for the U.S. home building industry could be fully integrated off-site solutions (FIOSS), also called off-site construction, as has been done in Europe and Japan. 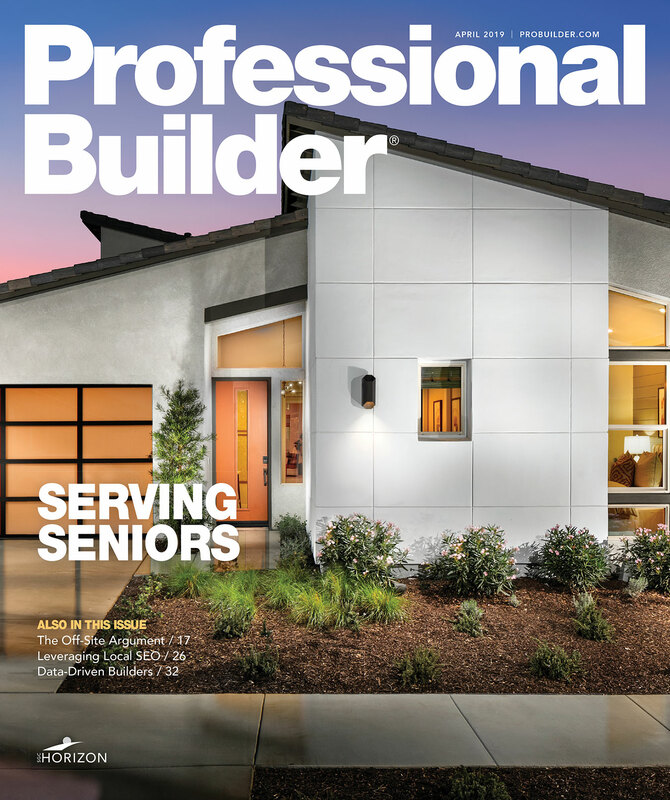 In August, Entekra completed its first delivery—a 2,800-square-foot, two-story home in Los Banos, Calif.—that was designed, engineered, and manufactured at a 30,000-square-foot plant in Ripon, Calif. The builder client typically schedules 17 days to frame this structure, but the Entekra order was erected and fully enclosed in less than five. 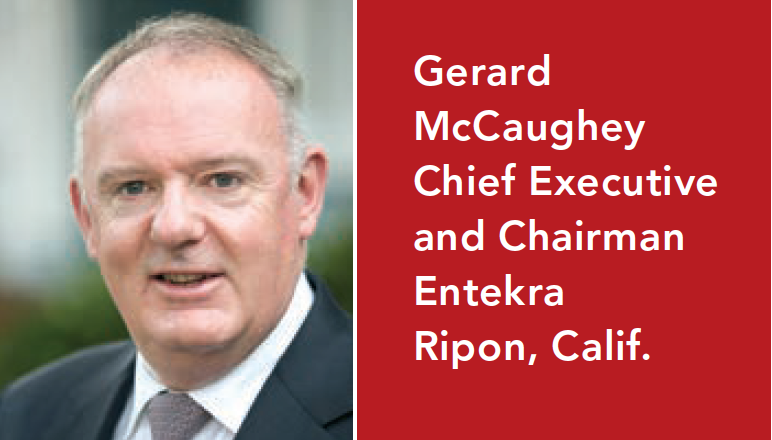 At speaking engagements, Entekra CEO Gerard "Gerry" McCaughey likes to show a time-lapse video of two framers and a crane operator completing the shell of a two-story house in Dublin, Ireland, in one day. McCaughey built more than 8,000 units per year in this manner in the U.K., Ireland, and Scotland before selling Century Homes, Europe’s largest off-site building manufacturing company, to Kingspan Group. The Ripon facility was built to test the market, and thanks to industry interest (McCaughey says seven of the top 15 builders in the U.S. have approached Entekra) company managers are planning to open a 150,000-square-foot facility in Northern California within the next 18 months and are scouting for a Southern California location that can service builder clients within a 200-mile radius. Q: What distinguishes FIOSS from modular, prefabricated, and manufactured home construction as it’s done in the U.S.? A: We come with a European perspective of off-site construction that looks at building from a holistic point of view. You try to help that builder build as quickly and efficiently as possible using the least amount of labor and material. When you look at building from that perspective, the prefabricated elements are merely an output of our engineering, whereas in the United States they are seen as components. We don’t see the reason for our existence as suppling components. We’re not concerned about selling timber or selling a commodity. We’re only concerned about helping the builder get that whole building up as efficiently as possible. It’s a holistic view of the building, and the first thing we do when we get a drawing is bring it to our engineering department. We have to reengineer the building to make sure we don’t impinge on the value that the prefabricated elements can bring to the process. We would never simply sell somebody walls. We make walls, but we will only supply you a system. If it’s not a system, it’s not a solution. The idea that you’re stick-building a building and someone [suddenly] decides they’ll use some prefab walls on it ... That doesn’t achieve anything because it’s not a holistic view. We’re looking at every element and at the logistics of how all those components and pieces fit together. We also bring related product logistics. For example, we can sit with a builder and discuss when he should have his plasterboard delivered to the building. Typically, builders bring in their Sheetrock after the building is framed, through the largest opening they can find. We’ll tell our builder: Why not have your Sheetrock on site on day one? Put it on the slab and we’ll build the walls around it because we’re going to have a crane on site anyway, so let us help you improve the logistics. One of the other things we do, which is standard in Europe, is prefabricate floor panels. In our view, if you think prefabricated walls or prefabricated roof trusses make sense, how do you not think that a prefabricated floor makes sense? Our whole system has elements that have been factory engineered and designed and are all made by one company to fit together. 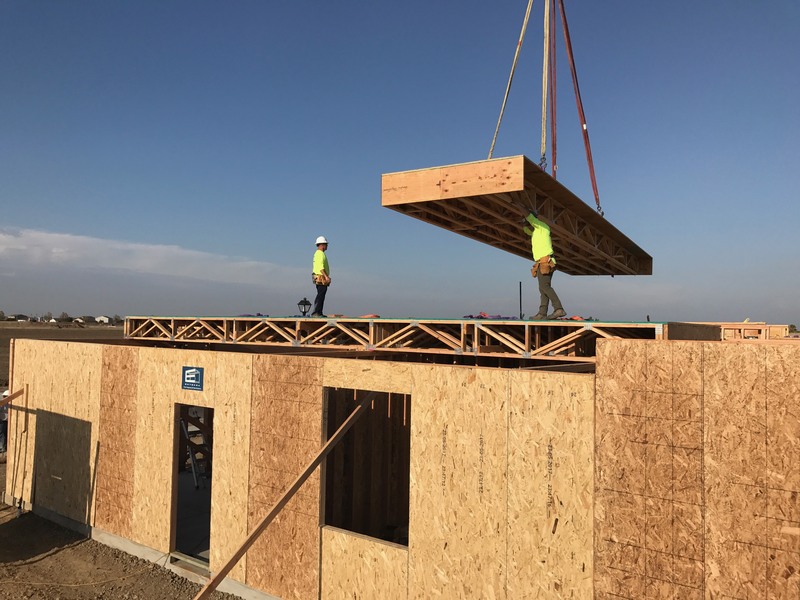 Entekra floor panels being lifted onto what will be a two-story, 2,800-square-foot house in Los Banos, Calif. Framing was completed in less than five days (Photos: Courtesy of Entekra). Q: What happens during pre-construction and how long does off-site construction take? A: If you take a typical 2,500-square-foot single-family home, once we have it in our system, the time frame between the builder giving us an order and us delivering the first house to site is typically eight weeks. After that every house can come every week or every two days if that is what the builder wants. It’s only the first one that takes longer because we’re doing all the initial work of looking at the whole building. We’re encouraging our builder partners to come to us as soon as possible, so we’re doing all the work on the house while they are doing all the other work to get ready on site. When the plan is being put into our system, that is where we identify conflicts like a plumbing stack running through a floor joist? Our process takes that builder’s drawing and runs it through our computer system. We will produce a full set of frame drawings that will show every single detail, every single member, plate, and nail in that building. We give those back to the builder, and we will go through that with him and say OK here is where we saw the conflicts, here is where the changes are needed to be made. Are you happy with these changes? For example, we had one recently where it was clear when they had a bath put into it that the waste pipe from the bath was going to go through the top chord of a floor truss. Somebody is going to have to move that onsite if we don’t re-engineer and move it now. There was another one where the duct was coming up from under the garage up through the floor and into the house. We were able to move a wall to avoid an awkward bend in the duct work, which made the room design better and made the ductwork vertical without putting a bend in it. Q: How many employees are at the manufacturing plant? A: We are in startup so there is a small number of staff. When I sold my previous company in Europe, Century Homes, we had 650 employees; 140 to 150 were in design and engineering. That will give you an indication of how heavily focused we are in design and engineering. Q: Tell us about Entekra’s design and engineering? A: That is our core. We think of ourselves as a design and engineering company that happens to have manufacturing bolted on. We don’t think of ourselves as a manufacturing company. Our value is in our design and engineering. The components, the manufacturing elements are merely an output. Our design and engineering department brings value to the customer. It’s our ability to look at a building and design and engineer it in such a way that it uses a minimum amount of material and goes up as fast as possible. We don’t accept that a drawing hammered out by an architect or an engineer is necessarily the best way to design or frame a building. We need to take that in and design it fully. Value engineering is such a maligned word. I don’t even like using it because that underestimates what we do. We’re looking at buildability onsite, energy efficiency, and manufacturing capability. It’s a completely different process, and we’re looking at it from a helicopter view. We’re not just looking at the walls, or the roof trusses, which is what component manufacturers here do at the moment. That’s important thing to understand why this market hasn’t taken off until now because pretty much the guys who make the components here, all they’re doing is just that. They’re not looking around and asking what are the inhibitors. They’re accepting what was already there and working their way around it. We’re saying there are better ways to do this. We need to find them, work with people to develop new systems, so we can enable (off-site construction) to gain traction in the market place. Right now, we’re working with an (American) manufacturer who makes the hold downs on the (concrete) slabs to develop new hold down systems. No one asked us to do this before. Q: How do you vet new products before including them in your system? Q: Why do you think off-site construction hasn’t caught on here? A: Because wall panels and roof trusses are not a system whereas off-site is fully engineered and is an off-site solution provider. Components don’t solve problems. I’ll give you an example. If a framer requires five people on site, he sees all that labor as being a fixed cost to him. If a builder comes out and says to the framer, ‘I want you to use wall panels’, the framer may be able to achieve some time saving on site, but he still requires the same five people on site because he’s still doing the same process when it comes to laying on the floor, and he still has to sheath those walls. Prefabricated components alone don’t bring any significant saving to the building process itself. The builder who decides to use prefabricated wall panels on 2,500-square-foot single-family home might save a day on what typically takes him 10 to 12 days to frame, whereas with a holistic off-site system, we can frame in three days. Q: What impact can off-site building have for a builder customer’s build cycle and profit? A: There are two ways that we dramatically affect the profitability of a builder. One is that the total unit cost we believe actually comes down. Why it comes down is not because we are saying we are cheaper per se in terms of getting the building up, but because of all our ancillary benefits. In other words, the builder will have less waste on site, he will over time have lower workers comp insurance costs because there is less chaos on site because this process is simplier. He will have more efficient response from his other key trades that he brings on site because of the accuracy and the quality that we bring to the frame. Typically the other trades, whether they’re tilers, painters, cabinet makers or countertop guys, they under pressure to supply the market and they’re giving the best service to the builders that can give them the best house to work in. they’ll know they have less work to fix or less angles to cut because the building is more accurate. Over time that will save the builder as well. The builder also will save on overhead, which he can’t cut right now, but the big benefit is productivity. 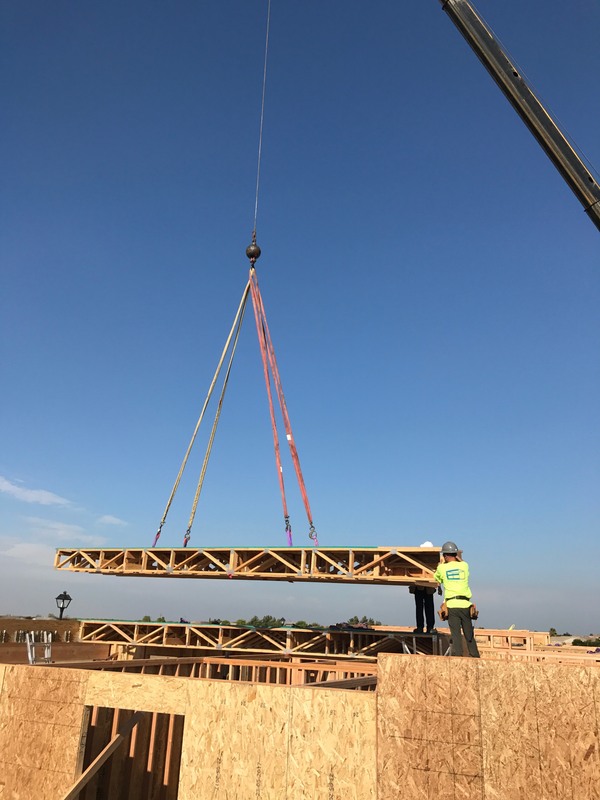 We cut the framing time down by 66 percent so even with the same number of guys on a framing crew, that crew can be split into two and do two houses at the same time faster than the current single crew could do one house. So the focus is not on the unit cost of our system versus stick framing. The focus is on the productivity gains that are brought to the builder and what it does to his bottom line at the end of the year. Our discussion with the builders at the moment are more about the construction cycle time and how those affect profitability. Time is money, and I can’t say nor can builders agree on what a day saved on site is worth to them, but there are reports out there that say it's anywhere from $200 to $850. At PCBC a builder stood up (during a panel discussion) and said $1,150 a day is what it costs him on site. If we are saving you eight to 10 days on framing, that could be $2,000 to $11,000 worth of saving there but then the added gain is our system can shave another 10 to 20 days off the build cycle because we enable everyone else who comes to that house after framing to operate more efficiently. Those savings are indirectly related to us. Our experience over the last 30 years is the builders who switched to our system tend to shave approximately 30 days off the total construction cycle. Q: I think a light went off with one builder who was at the PCBC conference you spoke at. He stood up and said after hearing your presentation that he was thinking about getting the value for his product from design and from selling the land and just farm out the construction to someone else. A: Well, that’s correct. Most home builders are really good at making money out of the land entitlement and the design of the building. It’s not really about the construction; construction the physical part that is the most hassle for them and the difficult part. We take a lot of that hassle out of the process. Q: And that’s how some larger builders are set up anyway. They’re more like a sales company selling design and holding and selling land. A: That’s correct. The part in between the home builder is named after is the part that they least like to do. That is the hardest part. When you are dealing with land or sales, you don’t have to deal with 10 to 15 subcontractors and worry about whether someone is going to show up or if materials are going to be delivered. That is the beauty of off-site. We take so much of that variability out of the process. I genuinely to this day don’t understand why everybody in the United State has allowed stick framing to continue to be the dominant method of construction when to do so is to effectively say that the last 100 years of technological advancement didn’t exist. The iPhone has only existed for 10 years. WiFi didn’t exist 25 years ago.The world has changed in every single way you can think of, even the way cars are build has gotten more efficient. Yet houses are being built exactly the same way they were 100 years ago. When you go to Europe or to Japan, the European and Japanese would never think of stick framing a house because they actually have applied the last 100 years of technological advancement to the house construction process. Missing is the proof of this approach which is what was the all-in construction cost for that 2800 sq. ft. home? In 1999 our company first explored the feasibility to convert to building timber frame with offsite construction. We had two major challenges. Firstly, will Irish home buys want a timber frame home and secondly is it more productive? Faced with skilled labor shortages and rising costs we explored the idea. Thankfully we partnered with Kingspan Century and made the decision to convert on a project of 660 high density homes in Dublin 16. The results spoke for themselves. Completed in five years. Most home builders need to rely on smaller Mum & Pap organizations (20 employees or less) to provide the trade elements to a home and this is exactly when FIOSS is so beneficial. Consistent, Accurate, Scheduled work on site is rarely achieved however once you convert to FIOSS all these benefits are available. This will save both time and money for you and all your trade partners. Reduced labor, reduced time, reduced waste, safer working conditions, increased productivity all equals to better bottom line. Any home builder within 200 miles of an Entekra factory should seriously consider this process. Unless you are happy with continuing to build stick frame homes like your ancestors. William Shakespeare said, “You are what you tolerate” I have experienced this process first hand in Ireland. One off bespoke homes to multiple communities FIOSS will benefit the Constructor-Trade Partners and finally the owner.